Image courtesy of Bill Walker . Hi, it’s Bob. For old friends, thanks for checking out the site. For those who don’t know me, I hope you’ve signed up for class or are going to come on one of my trips. I strive to deliver beautiful birds, fun, education, and some intangible thing the spinmeisters have invented called: value-added. Hopefully, we'll both know it when we see it. Lifebirds is a state of mind. Sometimes it really is about that first-time, heart-pumping, incredibly exciting sighting of a bird you’ve never seen before. Sometimes it’s just finally seeing definitively, a bird you’ve only had fleeting, non-satisfying glimpses of in the past. ; “a good bird well seen” as we like to say in our family. Sometimes it’s just an extraordinary wash of euphoria brought on by being with friends in the outdoors. That happens sometimes, honestly. Sometimes it’s a huge laugh in class…. and that happens too. But somehow, the birds are central, and the unifying force. Bless their feathery little wonderful selves. The more I’ve talked about life birds, the more the phrase has resonated with me. I’ve come to realize that the phrase has way more meaning, at least for me, than any single bird on my list. Sometimes it’s about a bird, sometimes it’s about a trip, most times, it's about a magic moment that has to do with our little tribe. Birders. The Ivory-billed Woodpecker is THE "Lord God" bird. We all know that, yes? As in "lord God, what a bird......" At least that's how it's told. Explained. Handed down in the oral tradition. Sometimes life birds are birds you happen upon and are blessed to share with others. Sometimes they're birds that are reported by others and when you can, you go look for them, and maybe you're by yourself and maybe you're with others, and maybe you bump into other members of the tribe. And then, sometimes, you're given a gift, and there's a "gathering." 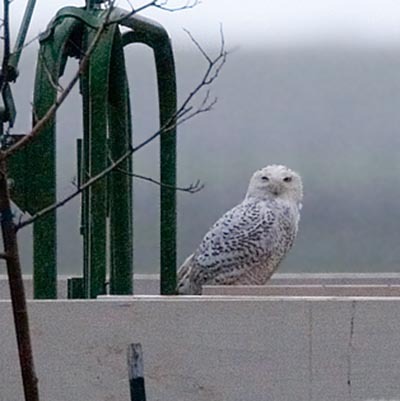 The Snowy Owl of 2006 will be known for many years as the "Solano County Owl" or the "Solano County Snowy." Joan Humphrey "gets after it" in Solano County and the greater central valley and is seen/heard posting sightings on a weekly basis. I picked up Steve Hampton's e-mail off of CVbirds' Listserv at about 2 p.m. on a Friday afternoon. "I just got a call from Joan Humphrey. She's looking at a Snowy Owl on the shoulder of Liberty Island Rd in Solano Co (just south of Yolo Co line). The location is Liberty Island Rd, 0.25 mile south of Swan Rd." Fateful words. Telephones of birding buddies started ringing throughout the state. Schedules were scanned. Appointments were cancelled. Excuses not used for a long time were being rehearsed. Luke Cole put out the coordinates and directions to Calbirds: "..... and after that last turn, look for the traffic jam." Cute, but prophetic. Chris Conard did the research. What we all wanted to know: A Snowy Owl had not reliably been reported in the state since 1978. Many birders were considering a trip to Seattle or Portland to try for a Snowy Owl in more traditional wintering habitats. Solano County and Snowy Owl didn't compute. But, who's to argue? The adrenaline started to pump. Peanut butter sandwiches were being slid into zip-lock baggies throughout northern California. Thermoses were being rinsed. Binoculars cleaned. Cheri Pillsbury captured many sentiments: "Thanks for finding the bird, Joanie. I was going up to Portland Sunday to look for my lifer Snowy and was really worried about the winter driving. Are the Birding Gods granting me a boon? Let's hope so." Bruce Mast and I were to lead a field trip for a bay area adventure group that day. Fate would have it that the group wanted to see Sandhill Cranes flying in to roost at night, so the group didn't want to start their day until 12:30. A birding outing that didn't start until 12:30. Who'da believed it? But that left the morning free to roam. We were roaming for a Snowy Owl. I did sleep that night, some. 2 hours? 3? It wasn't much. Whatever adrenaline the Snowy Owl needed to fly from the Arctic tundra to Solano County, I was sharing. In some very subliminal way. Every time I stirred, I would smile, fight back the anticipation, let it build again, smile again, and try to go back to sleep. I mean seriously, they had the bird staked out when it became dark, how far could it have gone if we were there at dawn? Then again, it just flew 2500 miles. How naive am I? Grim professional? or Giddy school-boy? Dawn had us on Liberty Island Rd. slowly driving past 3 or 4 vehicles heading in the wrong way. We slowed. Windows down. A friendly birder, "owl-like eyes?," oh the imagination. "Any news?" The birder said: Someone had the bird fly over the road here. We're trying to find it. Did he say "bird?" or "Owl?" Do we know him? Trust him? This is 3 miles north of where we want to be. What if they saw an Egret in the dark? We decided (I decided; I was driving. Adrenaline sometimes robs me of the power of speech, or thinking. I mean, the greatest birders known to mankind, California birders, were not up at 4 a.m. and driving to some backwater, just to mistake a Great Egret with a Snowy Owl. But I'm Irish.) to drive to last night's last known locale for Snowy, and work our way back up the road. We ran into Brian Fitch at "the spot." Last night's last known location. Brian is a premier birder. Brian didn't have the bird. We got out of the car for the first time. It was cold, it was windy, there was rain in the air. A day filled with anticipation and electricity. We layered up. We scanned. We scoped. Snowy no esta. Egrets everywhere. A concentration of Northern Harriers at dawn that would have commanded my attention any other day in my life were given a passing glance. Every flash of white got the heart pumping just a little bit faster. Bruce would mumble something and I'd spin the scope in his direction so fast I could have knocked over a small heifer. No Snowy. We told Brian about the possible sighting three miles to the north. He had arrived ahead of almost everyone in complete dark, so he wasn't aware of the hubbub 3 miles to the north. You could see the wheels turning. Stay? or go? Chase or wait? Bruce and I compromised and decided to drive the road back north in 1/2-mile increments. Stopping, scanning, and scoping at each stop. We executed these perfectly choreographed, intensely professional, thorough and relentless birding forays, twice. Synchronized birding. You go clockwise, I go counter clockwise. I peak over my shoulder to see if you've stopped to look at something more closely, and then I swing my scope over to where you're looking to see if I can poach it first. Oh birding. Brings out the best in me. We were moving to our third spot when a truck came rolling up, heading south. Wrong direction, thought I. The woman behind the wheel had her window down. Just as I was about to say: "wrong direction," she said: "They have the bird at King Road. A mile or so up and then turn right." It was Joan Humphrey. Making sure everyone got to see her Snowy. Did she stay and gawk at the Owl? No she drove 3 miles up and down Liberty Island Road to take care of the rest of us. What can I say. We thanked her. We didn't speed. Honest. I relaxed, finally. At least a little bit. A long line of vehicles was pulled over on King Road. The inventory appeared to be: 15 vehicles, 33 birders, 22 scopes, approximately $100,000 in optics, not including cameras. Our tribe. There was a fenced area with some farm equipment in the field to the south. All scopes and binoculars were pointed at the fence. You didn't really need to ask anyone where the bird was, or if they had the bird, or heaven's sakes: "have you seen the bird?!" You just needed to point your scope at the white fence and look for a white lump. And that's just what we did. And that's when I fell in love. There were no high fives. There was no shouting. It was, and I'll get to this more in a minute, but it was like the grand unveiling of a work of art. Quiet appreciation of the most genuine kind. By those who new what they were looking at, in every sense. The Owl, its rarity, its journey, its beauty. Lots of smiling faces. Lots of shared scope views. Joanie was being thanked by everyone. Her moment. She will ride on a cloud for a long time. Lots of warm greetings and re-kindling of friendships. No babies were laughing, and no grown men were crying, but it was pretty darn close to one of those moments. You remember, yes? The Solano County Snowy? I don't study art, I study birds. All day Saturday I was struggling with questions about what is it about rare birds that make the heart sing? This Snowy Owl is/was intrinsically beautiful. I know that. And I also know that its rarity (rareness?) adds another element. If there were a thousand Mona Lisa's, would the one, the original, still be beautiful? I think the answer is yes. But it's individuality and rareness must glow in some special way. It must speak to the heart and soul of the true lover of art. Somewhere in that kernel of thought is what was/is going on between me and the Snowy Owl.